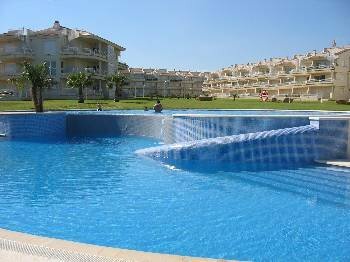 Beachfront high class apartments, sleeps 4-6 and 6-8 people, AC, swimming pool, parking, garden. On the coast between Barcelona and Valencia. Apartments with 2 and 3 bedrooms and 2 bathroms. Front line to the ocean and the beach. Top quality apartments with all conveniences. Wonderful apartment complex by the Playa del Moro beach in Alcossebre, Spain. On a clear day one can almost catch a view of Mallorca on the horizon. Two complete bathrooms with bathtub and one with additional shower. Separate kitchen equipped with dishwasher, combined fridge/ freezer, oven, marble bench, spacious cupboards. The kitchen is equipped with crockery, cutlery, pots and pans, etc for 4-6 people. There are no bathtubs in apartments where massage showers are installed. WiFi is installed throughout the complex. Access codes can be purchased at the corner store (50 metres away) and at other stores in the village. Discounts apply to two-bedroom basic rates ONLY and not to three-bedroom apartments, nor to extras. Late booking discounts of 25% and 40% are for a minimum stay of two weeks. Reductions for shorter late-booking stays will be offered upon request. Second floor apartments have roof terraces, either south, east or north facing. Some of the apartments have mountain views as well as views to the ocean. Some are ground floor apartments with park area directly down from the terrace. Those on the first and second floors are accessible by elevators as well as from the staircase. Most of the apartments are south facing, some are east and some are north facing. The beach is directly in front of the complex. All 2-bedroom apartments have a sofa bed (double). There is normally access to the internet via neighbouring wireless connection, although ADSL is not installed in the actual rental apartments.